We love the opportunity to test drive brand new car models, and we like it even more when the test involves a day at the track. 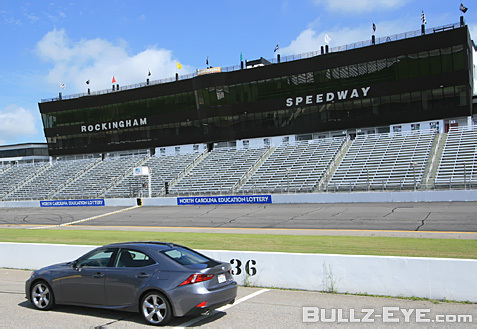 So naturally we were happy to join Lexus at Rockingham Speedway in North Carolina (“The Rock”) to test drive the all-new 2014 Lexus IS. We tested the IS 250 and IS 350, along with the F Sport version of the IS 350. There’s nothing like accelerating from a banked turn, flooring it once you hit the straightaway, and then slamming on the brakes just as you approach 100 MPH as you prepare to make a 90 degree turn. You definitely get the feeling of what a car can handle on a track like this, and each model of the IS was a blast to drive. Lexus is emphasizing its new “obsession with design” and we can see the results as the company has rolled out its aggressive spindle grille across its model lineup. The new front end gives Lexus a new, bold look that sets the tone for all of the design elements. I always liked the look of Lexus cars, but now I love them. Welcome to a new feature where we examine the best golf courses the world has to offer, and daydream about playing them before we die. 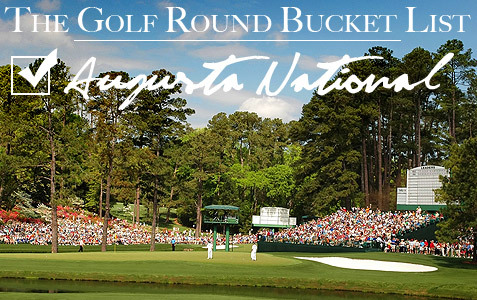 First up, naturally, is the course that is frequently rated the #1 golf course in the world and the host of the Masters, the Augusta National Golf Club in Augusta, Georgia. Here are some quick hits on the club and the course. Membership: The club has around 300 members at all times, and they are selected by invitation only. Dues are said to be around $10,000 per year, as the club makes the majority of its money from hosting the Masters, but despite those relatively affordable dues, you’re not getting an invitation to join unless you’re rich, famous, or politically connected, and you’re not playing the course unless you know one of those 300 people. Yes, it’s true: There are no women members, though they finally accepted a black member in 1990. When you watch those helicopter shots of each hole on TV, Augusta doesn’t look like a terribly hazardous course, but thanks to an abundance of trees, undulated greens and tee boxes that are a good 30 yards farther back than they were six years ago, there is scant room for error. Take a look at the green for the seventh hole, Pampas: it’s protected by five (!) bunkers, so if you don’t stick the green, you’re throwing a beach party. Then there is White Dogwood, hole #11, where you need to hit the ball at least 265 yards just to make it to the fairway. The course’s toughest hole, though is the tenth, Camelia. (All holes are named for the trees or plants that line each particular hole.) The back half of the hole slopes downhill though the green is slightly elevated, with a bunker to the right and a monstrous, storm cloud-shaped bunker in the middle of the fairway just before the green. No one wins the Masters on the 10th hole, but lots of people have lost it here. The hole we’re most eager to play, though, has to be Rosebud, the par-3 16th hole where, in 2005, Tiger Woods made the most spectacular shot we’ve ever seen. How on earth did he do that? As Verne Lundquist said, never in our lives have we seen such a thing, but here’s hoping that someone makes us take that statement back this weekend.